When interior space and serenity really matter, the Sentra delivers in a big way. Those facing long, tortuous commutes will also appreciate the practical charms of its Xtronic Continuously Variable Transmission (CVT). Standard on all but the base 2.0 model, the CVT earns better EPA mileage numbers than the six-speed manual. It is reliable, fuel efficient, easy to operate, good quality and decent price. I have owned my Nissan Sentra for 8 years now. I find it to be a very functional vehicle for the money. It also has a somewhat luxury feel for the money as well. The materials used are good quality and have held very well over time. Mine has a tan interior and there has been very little fading of the console or fabric. It is also very easy to shampoo and clean. With regards to mechanical issues I have had no issues a all aside from general maintenance. Such as replacing spark plugs. Additionally the brake pads and tires that came standard with the vehicle held up well beyond their standard life and were good quality. I use this vehicle as my daily driver and it has a bit over 100, 000 miles on it. The paint also has held up well especially considering I don't wash it on a regular basis and have only recently started waxing it. The only parts that have shown wear is the door handles. Inside the only thing that has started to show signs of disrepair is the headliner, at the rear it has started to peel down and will need to be glued backup. All and all I have no complaints and this vehicle has held up exceptionally well with very little maintenance and upkeep. 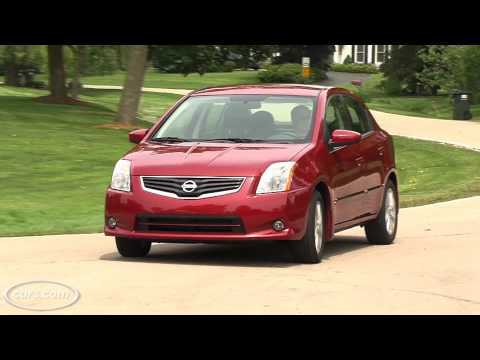 Highlights about 2010 Nissan Sentra!! I have had this car for about two years now. I use it for mostly commuting to work and school. It has automatic windows and locks, great gas mileage (about $20-$26 to fill up), radio settings on the steering wheel, large glove compartment, smaller dash compartment, cup holders in the front (that adjust to the size of your cup) and the back, and rear window defrost. The back seats lay down to provide trunk entrance or for add trunk space and have an adjustable armrest with cup holders that can be raised into the seat for a middle back seat passenger. The a. C. And heat work very well! The trunk is spacious and roomy with a hidden spare tire compartment in the bottom. It handles well. It does have a dock for an iPod mini and charging adapter inside of the arm rest, as well as a dock for another charging adapter under the dashboard. There are no USB charging ports however and only a standard digital radio/cd player with an AUX port. The good & the bad with my 2010 Nissan Sentra. I love how economic my Nissan Sentra is as far as gas & oil changes definitely light in the wallet but the safety end of it I am not too happy with for instance on windy days driving in the highway does not feel too safe I literally have to hold the steering wheel with two hands very tight to keep it stable and even then it’ll at times sway from side to side and this is not on extremely windy days I am talking about a rainy windy day stability just is not there also once you reach 65/70 mph it starts pulling as if it's going to stall or shut off feels as though is struggling to push this speed I have listed both the good perks as well as the bad for inside the city driving is perfect u don't feel any mishaps but once on the highway it can be a little weary hope this helps:).